KYLE is gearing up to release his new solo album SPEED OF LIFE Tuesday, August 19. To celebrate, the longtime homebrewer has decided to combine his two passions--music and craft beer--and is offering fans three free “Hop Tracks” from the upcoming album, each to coincide with the limited edition release of a nationally distributed craft beer by three different renowned breweries from across the country. Just as each beer was designed and handcrafted by KYLE and the respective brewery, each track has been hand-selected to pair with its respectively released brew. · Collective Distortion IPA—(available now) a collaboration with Stone Brewing Co.: KYLE teamed up with Stone Brewmaster Mitch Steele and hard rock guitarist Keri Kelli to create Collective Distortion IPA, available now via limited 22-ounce bottles and draft. Collective Distortion IPA offers a complex blend of floral, citrus and lemon flavors that balance well with a strong malt backbone, suitable enough to please any extreme hophead's palate. From using Vic's Secret, a new Australian hop varietal, for dry-hopping, distinct citrusy, pineapple and earthy-pine qualities are present in the flavor and aroma. Coriander and elderberries were combined to enhance the hop bitterness while still infusing fruit, earth and berry notes. In addition to offering a free download of THE STRING CHEESE INCIDENT’s “Let’s Go Outside,” off their new album Song In My Head out now, KYLE is also giving away a free copy of his new song “Racer X.” For more information on Collective Distortion IPA and to download the two free tracks, visit: http://www.stonebrewing.com/collab/collectivedistortion/. · Hoopla Pale Ale—(available now) a collaboration with Boulder Beer Company: In search of the perfect festival beer, Boulder Beer Company’s brewers and KYLE joined creative forces. Imagination and improvisation flowed freely, and Hoopla was born. Hoopla Pale Ale is dry-hopped with generous amounts of Glacier hops for a fruity, floral hop aroma and flavor that will have your taste buds dancing. It is available now in outdoor-friendly and convenient 6-pack 12 oz cans and on draft. Each can has a QR code linking to a free download of “Here We Go.” For more information on Hoopa Pale Ale visit: http://www.boulderbeer.com/beers/hoopla-pale-ale. · Cigar City Brewing—(available late summer): KYLE will also partner with Cigar City Brewing in collaboration with Rock Brothers Brewing in Tampa, FL, concluding his quest for beer collaborations stretching from coast-to-coast. Details on this brew will be announced in the coming weeks and KYLE will offer up a free download of “Happening Now,” also off his new album. For more information on Cigar City Brewing visit: www.cigarcitybrewing.com. 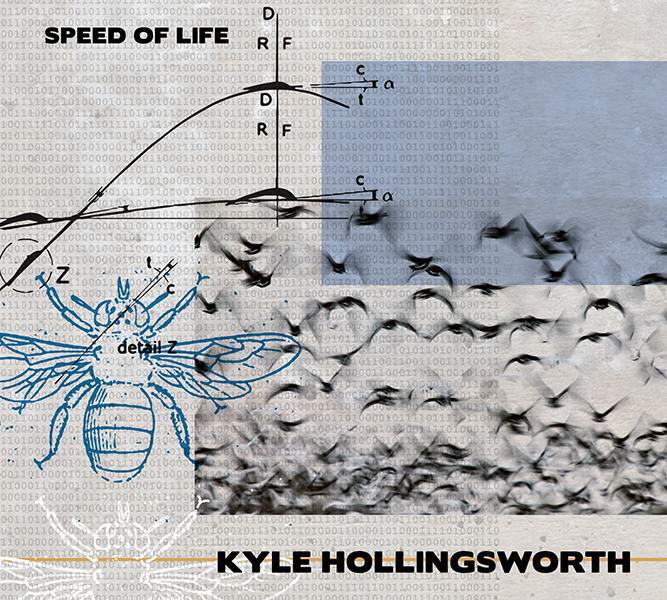 SPEED OF LIFE marks KYLE’s third solo album. It was inspired by all facets of his life--from beer to babies to music to mayhem--and ranges stylistically from ‘60s funk to modern electronica, featuring both instrumental and lyrical tracks. It was recorded during the well-known Boulder, CO, flood of 2013, where HOLLINGSWORTH was holed up in studio, fearing water would pour into the studio. SPEED OF LIFE brings together feature performances from many great artists and friends HOLLINGSWORTH has surrounded himself with over recent years including Dave Watts (drums - The Motet), Garrett Sayers (bass - The Motet), Dan Schwindt (guitar), Jason Hann (percussion - The String Cheese Incident), Michael Kang (guitar - The String Cheese Incident), Dominic Lalli (saxophone - Big Gigantic), Bonnie Paine (vocals - Elephant Revival), Gabriel Mervine (trumpet - The Motet), Matt Pitts (saxophone – The Motet), Kim Dawson (vocals – The Motet), and LaDamion Massey (vocals).